Over 21,656 men and women have ended sugar cravings and transformed their life...want to join us? Flush Away Years of Toxic Cravings and Finally Regain Control of Your Diet So You Can Skyrocket Your Energy and Drop Stubborn Weight Without Starving Your Body…In Just 14 Days (or Less)! Over the last week I’ve shared my 1-Day Craving Cure with you to show you that it IS possible to end the craving cycle...if you use the CRM Method. Now I want to get you started on my FULL step-by-step program that has already helped 21,656 people end their cravings for good while becoming healthier than they ever thought possible. I’ve shown you that it is possible, no matter how “severe” your cravings...and that you can live a radiant, happy life...now I just need you to let me guide you the rest of the way. Sugar feeds the “bad” things in your body (like bad bacteria, parasites, and toxins)...and we need to stop feeding the “bad” to halt cravings and be truly healthy. But, quitting sugar isn’t that easy. And if you can’t simply “willpower away” your sugar habit, you aren’t alone. When your blood is toxic -- it craves more junk, and you get stuck in an endless loop of cravings and guilt. As you probably know, sugar addiction comes with a whole lot of negative side-effects. How many of these are you feeling on a weekly basis? ...no matter what you do, what you eat, or how you exercise you can’t stop thinking about sugar or other carbs...and the only time you aren’t eating sugar is because you’re using willpower, NOT because you don’t want it. ...that can only be remedied with caffeine or sugar...and even then you likely feel like a zombie and wonder how you had so much energy when you were younger. You also daydream about taking naps after lunch and can’t make it through the afternoon “lull” without some type of pick-me-up. To the point where you know your food controls you, instead of the other way around. Especially if you’ve been battling cravings for years and haven’t been able to stay sugar-free for long periods of time. That gives you headaches and makes you feel weak or dizzy. You also have trouble concentrating and wonder why sometimes it’s so hard to focus on what you’re doing. Because you either gain weight consistently (no matter what) or you’re stuck at a frustrating plateau that won’t seem to budge...even when cutting back calories or exercising more. It’s not just about calories though; sugar can wreak havoc on your hormones and organs...making weight loss biologically impossible. And willpower is the only thing that keeps you from diving head first into the nearest bag of candy. You also feel like you’re on a diet and missing out on the foods you really want to eat...which is really the unhealthy bacteria begging you to feed it more sugar so it can grow faster. Are you tired of feeling held hostage by uncontrollable cravings? Do you want your body to finally let go of stubborn weight it’s been holding on to for years? Are you sick and tired of “yo-yo dieting”? 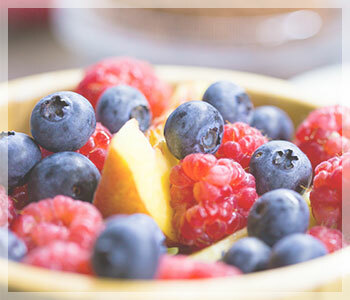 Are you tired of depriving yourself of delicious food? The key to fixing all of these problems starts with getting yourself off of sugar. If that sounds intimidating or even impossible to you, stick with me and I’ll show you how you can do it 100% guaranteed. Seriously: if this doesn’t work for you, it won’t cost you anything. There’s no risk to try it out because I’m that confident you’re going to join the group of 21,656 people who started right where you are right now...and now enjoy health they’ve only dreamed of. For years I ate plenty of cereal, donuts, candy, and milkshakes on a daily basis. 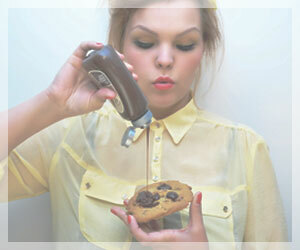 And, I wasn’t able to quit eating sugar by the truckload until I discovered the CRM Method. As you’re going to experience for yourself...when you can safely, gently, and easily conquer your sugar cravings, you’ll achieve health that you didn’t even know was possible before. Right now, you have no idea how good you can REALLY feel. Plus, it will all happen to you in just 14 days if you follow the simple steps I’m going to show you. First we’re going to clean the junk out of your blood so you stop craving sugar, chocolate, carbs, salt… and everything else you can’t stop eating. When your blood is purified of the bacteria, fungus, parasites and other “critters” that make you crave junk food, you’ll stop wanting it all the time and it’ll no longer look appealing. Second we’re going to restore proper cellular function to your entire body by giving it the nutrients it needs. This is going to help all of your organs and cells run like a well-oiled machine and you’ll finally start to feel healthier than ever. This is going to help properly regulate your blood sugar which will prevent the up-and-down roller coaster effect that leads to bad food choices. Finally, we’re going to follow a simple willpower-free plan to make sure your results stay with you for life. 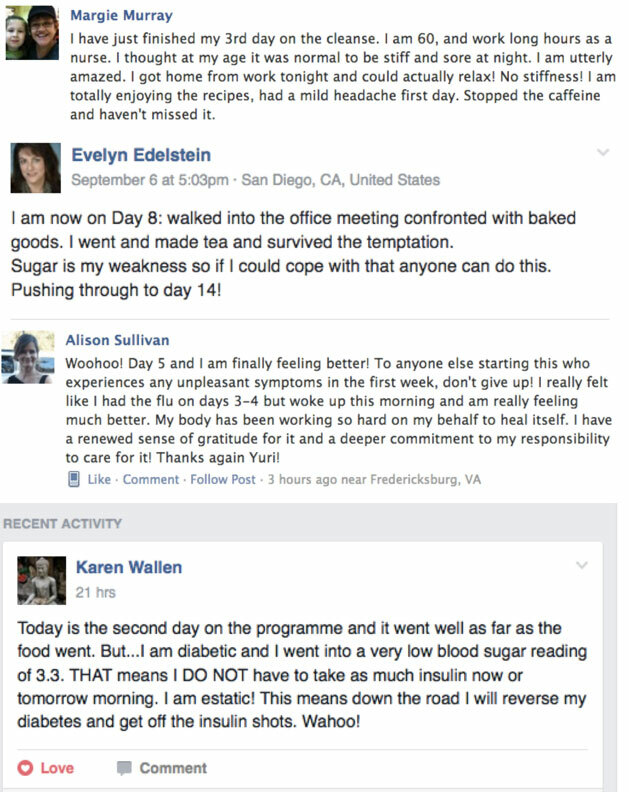 This is what makes the CRM method different -- never again will you have to yo-yo diet or only feel good temporarily. The CRM method truly is a miracle for anyone battling cravings. This is the most effective, safest, and even the tastiest way to evacuate sugar cravings from your life. No matter how severe your cravings are, in just 14 short days not only are you going to never crave sugar again -- you’re also going to feel like a completely new person. Shortly after starting this you won’t experience those nagging cravings that you can’t “willpower away”...your blood will be free of the little critters that make you crave sugar and you’ll start regaining control. Within a few days you’ll look forward to eating healthy and the junk that made you feel so awful won’t look appealing anymore. Food will never control you again. You’re 100% in control of what you eat and will never be held back by junk food or cravings thanks to the effortless and willpower-free CRM Method. You look noticeably younger, more vibrant, more confident, leaner, healthier, and finally comfortable in your own body. People look to you and ask “what are you doing?” because of the noticeable changes. Finally you have “that” attractive and radiant glow that other people want both inside and out. "I was on the cleanse for 30 days and lost 6 pounds the first week! Plus, so many of my symptoms disappeared, such as sinus congestion and drainage, headaches associated with allergies, low energy, cravings for sweets, negativity. My blood pressure is now normal (below 120/80) most days and I continue my pills only when it is above normal. 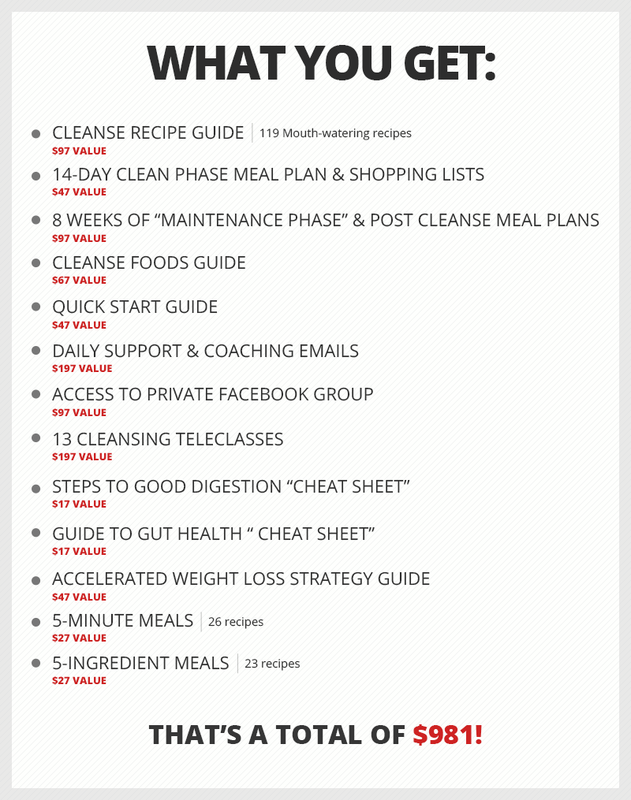 I loved the recipes that are included with the cleanse. I have a new appreciation for real food. On most weight loss plans I have tried I was urged to eat animal protein and since I have been lacto-vegetarian for 30 years, no meat, so I had to eat lots of cheese and soy. On the cleanse I was very satisfied without them. 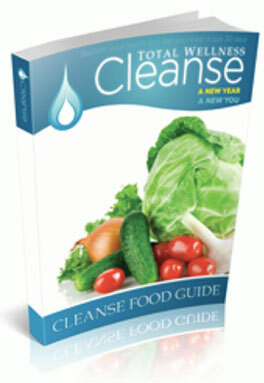 I highly recommend the cleanse for anyone with health challenges and/or food cravings. But...This Program Isn’t For Everybody -- Is It For You? So, Are YOU Right For This? Are you really committed to making your future better than your past? Are you coachable and willing to follow a proven program that has already helped more than 21,000 people? Are you willing to put aside your skepticism and have faith in yourself and our program? Do you agree to put in a little time each day to prepare these delicious meals? Do you agree that you’re worth it and that your health is a top priority? The Total Wellness Cleanse is my step-by-step body detoxification program that’s powered by the CRM Method. This has helped reverse even the most severe cases of sugar addiction. Just 2 short weeks from now you’ll look back and wonder how sugar held you back for so long. ...Since all disease and sickness begin in the gut, completing the Total Wellness Cleanse just one time has the power to give you health you never knew was possible. These are the most delicious cleansing recipes you’ll ever taste. After a few days of eating on the Total Wellness Cleanse, you’ll realize that being healthy doesn’t have to mean bland food. Inside this recipe book you’re going to find 66 mouth-watering food that gives your body those vital nutrients you’re missing which will revitalize your cells and detoxification organs, so you can purify your blood and get off the sugar quickly. I have 3 kids, a wife and a business…so these recipes are also quick. I don’t like spending all day in the kitchen which is why these can be made FAST. You don’t have to obsess over cooking and cleaning to do the Total Wellness Cleanse. It has to be quick, tasty, and healthy -- that’s my philosophy and promise to you. When I said this program is step-by-step, I meant it. The Meal Plans will show you exactly what to do from morning until night, so there’s no thinking or guesswork...you just have to follow my lead and I’ll show you the rest. You’re also getting my Cleanse Phase Shopping Lists which will show you what you need to buy at the grocery store -- and exactly how much you need. You’ll actually notice a nice savings on your grocery bill because you won’t have any wasted food or ever wonder how much to buy. 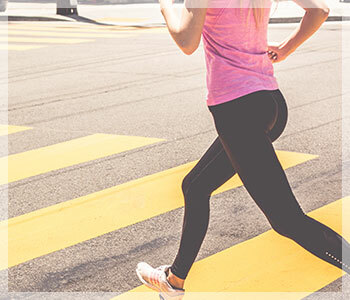 The “Maintenance Phase” is the second part of the cleanse that will help you transition back into your normal day-to-day routine while maintaining all of your results for life. Most cleanses deliver some results during the cleanse...but once you return to your “normal” diet and go back to your old eating habits your results vanish as quickly as they came. 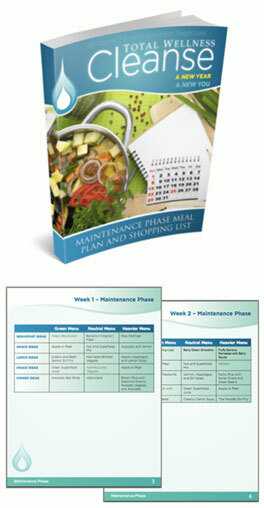 The Maintenance Phase meal plans are designed to avoid exactly that so you can enjoy your newly found health forever and end the vicious on-and-off yo-yo cycle. 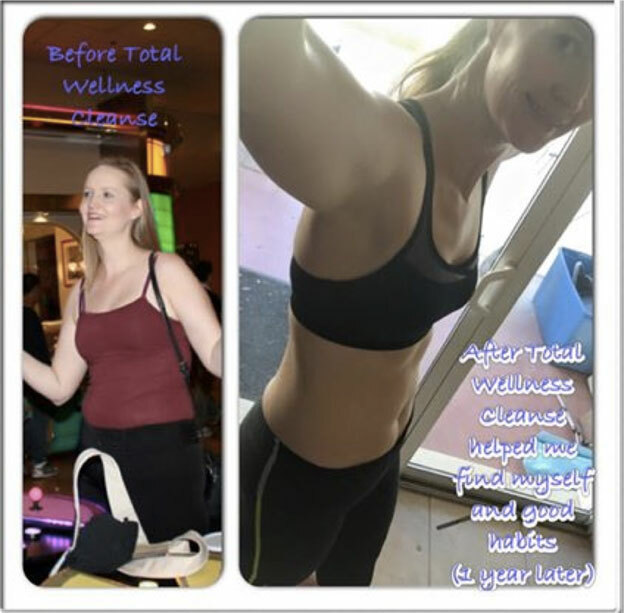 The Total Wellness Cleanse is going to help you get rapid results AND keep them permanently. "I have successfully finished your cleanse and LOVED the recipes, especially baba ghanouj which is now my daily snack. The Moroccan soup was also terrific. I feel much more alert, especially after quitting coffee and sugar, and I don't get bloated anymore. I am still following the diet, I love the fact have found a new love for clean food. Thank you so much for this program." Learn the TRUTH about protein foods, meat, and animal products. Do you need them? If so, to what degree? Discover the 8 foods that will RUIN your body – the very foods that we avoid during the 14-day Cleanse Phase. Depending on where your health is at right now this guide will help you choose which of the 3 cleansing levels is right for you. Whether you’re already pretty healthy or eating fast food daily, we’ll find the level that’s best for your specific situation. 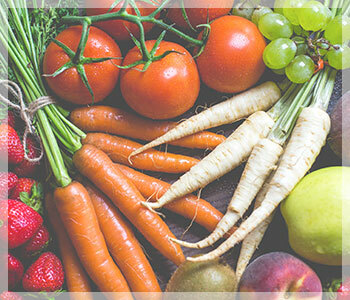 Every single day during the cleanse you’ll get a coaching email from me. This is your daily support that’s going to help you stay on track even if things get difficult. This email will remind you what you need to do on that day and what recipes you need to make. So if you simply follow the instructions in the email you’ll experience all of the results I’ve promised you...and likely more. These will also remind you why you’re doing this and what to expect along the way. Plus, you’ll get my best tips in case the detox becomes difficult from experiencing headaches or any other sugar-withdrawal symptoms. Here you’re going to get access to 1,000’s of other cleanse members from all over the world who have either gone through the cleanse or are going through it with you right now. If you get stuck, have a question, or just need some support and motivation, this group has your back. Our private group combined with the daily coaching email will give you an unprecedented level of help and support so you never feel alone or want to give up. This is a community full of great people that are here to support you on your journey. You’re not alone in this! That’s a total value of $649, and I’m completely confident that these components will give you the results you deserve faster than anything you’ve ever tried. But, there are 4 additional bonus gifts I want to give you that will help you reach your health goals even faster and break-through to the next level at warp speed. These 13 teleclasses are going to help you get "under the hood" and master your body's inner workings. You’re going to get truly life-changing health information that most people don’t know...and the best part is that you can listen to any of them when you commute, while you get ready for the day, or anytime. YOU DON’T have to listen to these to do the cleanse, but if you want a better understanding of health and nutrition this is an amazing resource that will empower you and give you a firm grip on your health. 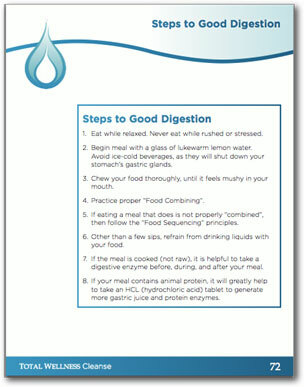 This is our 8-step process to ensure you digest your food as optimally as possible to prevent overburdening your body. This gift is extremely important because all health or disease begins in the gut...so if you’re not digesting your food properly you’re going to have big health issues. 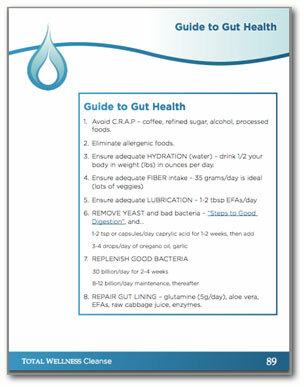 This 1-page cheat sheet is going to show you how to repair your gut, prevent digestion issues like leaky gut, and ensure your bacteria is in the healthy range in just 8 short steps. Again, your gut health is extremely important, not just for quitting sugar, but for your overall health. On our recent Craving Cure Blueprint webinar I offered you a limited-time $150 off discount that’s NOT available to the public. Since you haven’t started your Total Wellness Cleanse yet I decided to extend this special offer from the webinar to you. Your $150 off discount will only stay active until the timer at the top of this page expires -- so make sure you get started now! These 4 gifts (valued at $681) are my way of rewarding you for taking a brave leap into ending your cravings and reaching vibrant health. Most people talk about doing it, but here you are -- actually doing it! So take these gifts as my way of saying GREAT JOB for taking action to be the healthiest version of yourself possible. I’m going to give you an even BETTER deal! Regular Price: $297 Today Only: $147 Start My Cleanse Yes Yuri! I want to start the Total Wellness Cleanse for $150 off so I can put an end to my cravings and heal my body to make the rest of my life the best of my life! "I finally got rid of the last 10 lbs, I now can get into a smaller size and am very happy. Thank you Yuri!" What’s great about our cleanse is that you’re already eating food...we’re just helping you make better choices that are proven to heal your body from the inside-out! 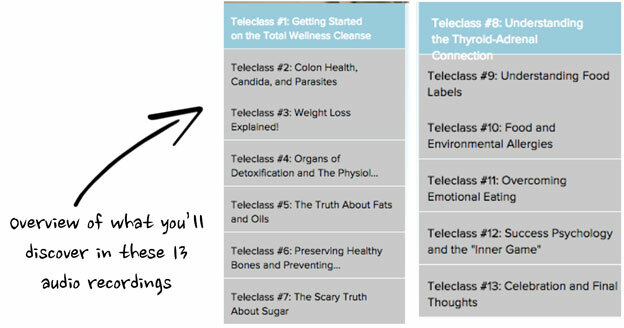 I have one more thing to give you -- if you’re ready to start your journey with the Total Wellness Cleanse right now. Our current “Total Wellness Cleansers” have sent us amazing feedback after getting results using these 3 special fast action bonuses. That’s why I decided to include them to help you on your journey -- but you have to get started TODAY for access to these. After helping 21,656 people go through this process, I noticed that A LOT of them were struggling with losing weight. Fortunately, I’ve also helped thousands of people lose anywhere from 5lbs to over 100lbs...and I discovered some weight loss secrets during that time. Inside this guide you’re going to get my FULL accelerated weight loss strategy that will help you QUICKLY shrink your waistline, without: grueling workouts, starvation diets, or eating gross food. 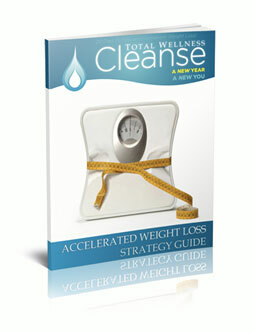 If you want to slim down while improving your health on the Total Wellness Cleanse, this is a MUST HAVE for you. If you’re like me, you don’t always have time to cook a meal. Even if it only takes 30 minutes. 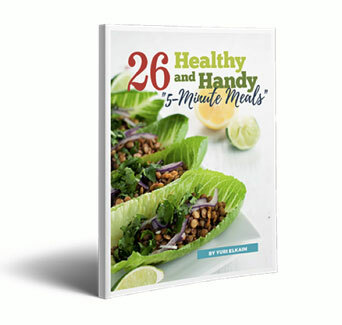 That’s why I want you to have this amazing cookbook I recently put together that’s loaded with 26 healthy, tasty, and handy 5-minute meals. Everything inside of this recipe book can be made in 5 minutes or LESS, and you won’t have to sacrifice one bit of incredible flavor. If you’ve ever tried eating healthy, there are certain aspects that probably frustrated you to no end. One thing many people get frustrated with is CONFUSING and COMPLICATED recipes that use 20 ingredients and take 3 hours to make. I hate those kind of recipes too -- seriously, who has the time? That’s why I also want you to have my 5-ingredient meal cookbook. You won’t believe how much flavor you can pack into simple 5-ingredient recipes. No longer will you need professional cooking lessons to make healthy food that tastes good! If you feel defeated and like there’s no way this will work for you, I understand where you’re coming from. I used to be in your shoes and after successfully sharing this incredible method with 21,656 men and women -- it’s your turn to transform. 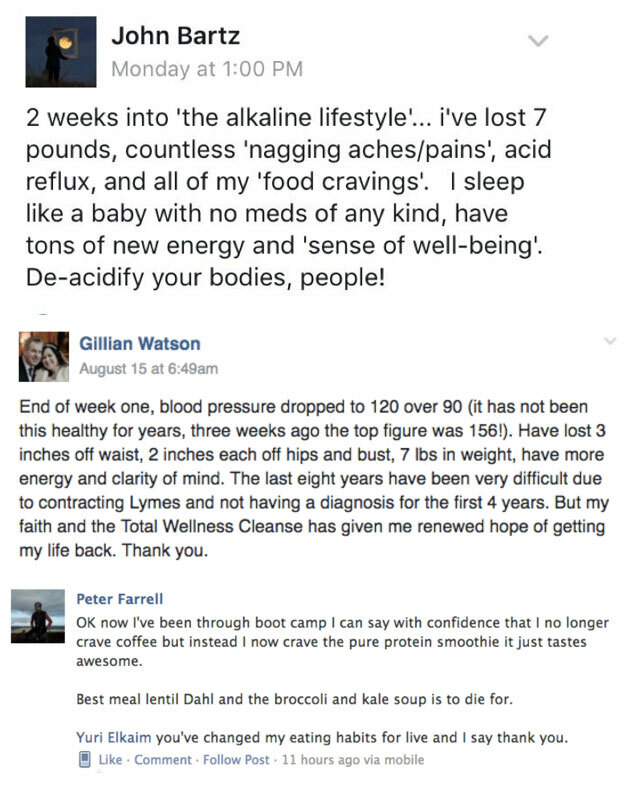 The Total Wellness Cleanse has completely changed the lives of so many other people, I know it will work for you too. The only time people don’t fix their sugar problems and come out feeling way better than ever is if they don’t do anything. You have 60 full days to try out everything for yourself and verify that this is what I promised you. That means you could go through the Cleanse Phase FOUR times before you have to decide if you want to keep the program or not. So pick it up and try the 14-day cleanse period...then take a few weeks to decide. There’s no risk to you and a completely new life waiting just 2 weeks away...you just have to take action right now. Remember: if it doesn’t work, you pay nothing -- I know you’ll see and feel everything I’ve promised...and if you don’t, I want you to have your money back. These are just a few of the thousands of life-altering success stories 21,656 men and women have experienced when they had little hope. It’s your turn to wake up energized and refreshed while being free of food cravings and nagging health problems. If all this did was help get rid of those nasty cravings and make eating healthy foods easier and tastier, would it be worth it? If all this did was help you drop 10 or so pounds...boost your energy...and ensure you don’t have to rely on deadly meds to stay well, would it be worth it? That your body can absolutely HEAL itself and come back to life - quickly! You FEEL attractive, healthy, confident, and, best of all, proud of your body (and yourself)…finally! Don’t let self-doubt stop you from doing this. 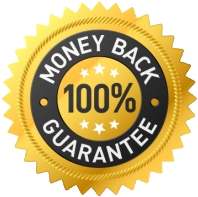 There’s a 100% money-back guarantee and it’s step-by-step simple. Just give it a try and if it doesn’t work, you get your money back. Most people don’t scratch the surface of how good they can feel day-to-day. Most people don’t even know how healthy they can be...at any age or fitness level and no matter how many pre-existing health problems they have. Did you have one of these common questions? 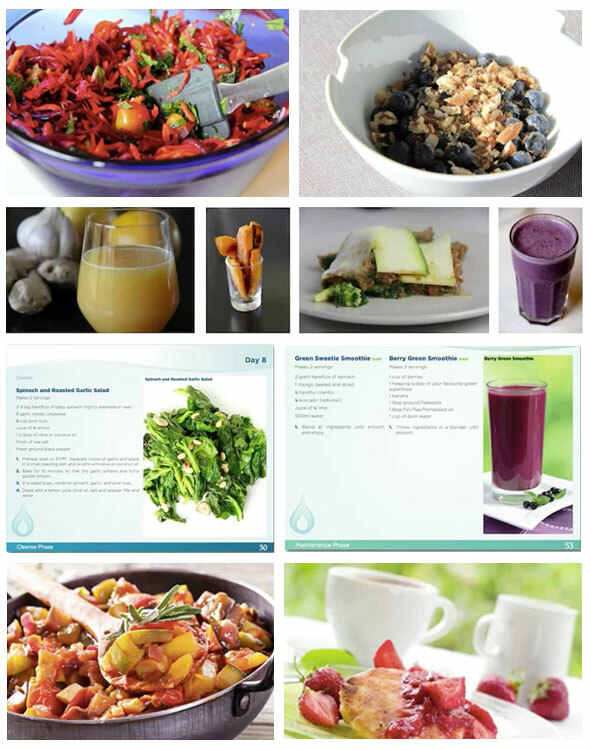 I’ve tried a lot of different healthy recipes myself, and I know first-hand how awful some can taste. I consider myself a “healthy foody” so every recipe was hand-selected by me based on the amazing taste and how quick it is to make. This is unlike any other “healthy” diet out there -- so give it a shot and if you don’t like the food we’ll give you a refund. Most people spend over $100 a month for service on a cell phone that costs $500 or more. Take a second to prioritize what’s truly important to you -- is your health at the top of that list? Think about how much more you can do in your life with a healthy body. Buying more ‘stuff’ will never fix the health problems you have, and you’ll never be able to live life to the fullest with sugar cravings and other health problems. If you truly can’t afford $147 in one payment, we also offer a payment plan above to break the cost up into 2 payments of $77. Remember: these are the quickest (and tastiest) healthy recipes you’ll find. We all have a lot going on and you probably don’t have any more time to cook than I do, so in the Total Wellness Cleanse each recipe will take no more than 30 minutes to make start to finish. 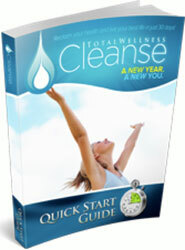 The Total Wellness Cleanse is completely different from anything you’ve tried in the past. Most cleanses focus on deprivation and literally starving you to drop a few pounds instead of correcting the root problem like we do. Keep in mind you get the guarantee too, so if you don’t get the results I’ve promised, you’re going to get a full refund. Q: "Will there be any "detox" side effects? Will I get cravings?" It depends...but they WILL go away quickly and I’ll share some strategies to minimize these type of side-effects in our daily coaching emails. Q: Can I still take my medication while on the cleanse? Pretty much any plant-based food. Q: "But I can’t go without eating meat. Will I be ok?" Q: "What if I’m vegan?" Q: "Are the recipes complicated, require expensive ingredients, or take a long time to prepare?" 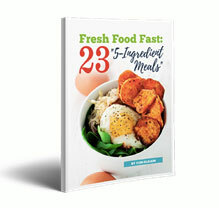 Plus, the first 10 people to get started ALSO get the 2 bonus recipe guides which include a combined 49 recipes that take less than 5 minutes to make and require less than 5 ingredients. Q: "Is this being shipped to me?" Q: "What if this doesn’t work for me?" You’d be the rare exception but, if for whatever reason, our Total Wellness Cleanse is not helping you look and feel a lot better after following it for 30-days, then just let us know and we’ll refund your purchase. 2009;120:1011-1020, published online before print August 24 2009, doi:10.1161/CIRCULATIONAHA.109.192627. 5. USDA. “Profiling Food Consumption in America.” United States Department of Agriculture. Sowers, Robert. 2010. http://www.usda.gov/factbook/chapter2.pdf. 6. “Role of Sugars in Human Neutrophilic Phagocytosis.” American Journal of Clinical Nutrition, 1973, 26pp. 1, 180-4).